The property is surrounded by 10 hectares of woodland and stunning lagoons with ducks and fish. 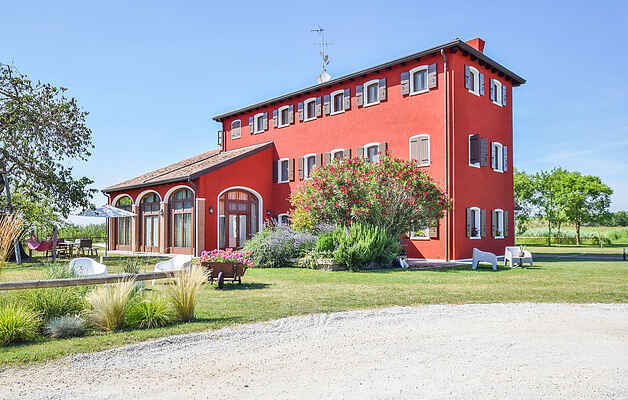 The farmhouse is located few steps from the beautiful Sile river and at guests disposal there is a private mooring space for 4 boats to descend down the river towards the sea or sail along the lagoon to the islands, this is not to be missed and real delight. INside the unit you will find an inviitng living/kitchen area, all well eqipped. There are also 2 bedrooms and 3 bathrooms. The property can accomodate up to 6 guests. Each unit has mosquito nets, 2 deckchairs and 2 chaise lounges by the swimming pool, so you can rest, relax and enjoy the sun. There are also 8 bicycles for 4 units for the guests to use, a safe box and hairdryer are also available. There is a natural park with inviting swimming pool and garden furniture, deckchairs, sun umbrellas and a gazebo with tables, benches and barbecue, so you can experience dingin alfresco and soak up the beautiful surroundings. Be sure to take time out to visit other interesting places such as Jesolo Lido beach: 800 mt (walking or bicycle path), or 15 km by car. There is a golf green1,5 km away (walking or bicycle path), or 15km by car. Approximately 30mins by car you can take a boat stop to Venice (30 mins journey) and Burano, Murano and Torcello islands. Something not to be missed.